How I Built This is a podcast about innovators, entrepreneurs, and idealists, and the stories behind the movements they built. Each episode is a narrative journey marked by triumphs, failures, serendipity and insight — told by the founders of some of the world's best known companies and brands. 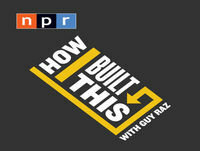 If you've ever built something from nothing, something you really care about — or even just dream about it — check out How I Built This hosted by Guy Raz @guyraz. Follow the show @HowIBuiltThis.